Supplementing with HMB may enhance exercise performance by preserving lean muscle tissue and limiting exercise induced muscle damage after intense training. β-hydroxy-methylbutyrate (HMB) calcium is a metabolite of the amino acid leucine. When HMB is combined with resistance training it may aid in the development of lean muscle mass, strength and the improvement of body composition. By improving the rate of muscle recovery after intense training athletes may be able to increase training volume and intensity leading to better performance gains. 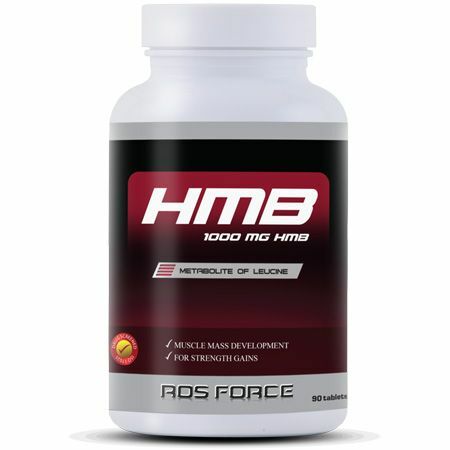 HMB from ROS Nutrition is a highly pure form of HMB that can be used to help you achieve your performance targets. Nissen S, Sharp RL, Panton L, Vukovich M, Trappe S and Fuller JC, Jr. beta-hydroxy-beta-methylbutyrate (HMB) supplementation in humans is safe and may decrease cardiovascular risk factors. J Nutr 130: 1937-1945, 2000. Take 3 tablets daily with water.